Long-time participants in the federal sector have clearly sensed that the volume of new lease-construct (i.e. build-to-suit) projects has declined substantially in recent years and that the government has been engaged in a spirited game of kick-the-can, leading to an unusually high volume of short term extensions. The result of these two factors is that the volume of space GSA occupies in new buildings is at an all-time low. Looking at the graph above, we can see that the square footage GSA occupies in buildings delivered this year (estimated) and last year is substantially lower than any other time in the past two decades. Admittedly, GSA occupancy of 2014 and 2015 vintage buildings may increase a bit over time but it is unlikely reach the levels achieved in the other years of this historical trend. The reason is that buildings leased primarily by the federal government are often lease-construct projects, and the volume of such projects is on the wane. 1. The majority of buildings 85%+ leased by GSA (those buildings depicted in the graph) are lease-constructs. This is true in most of the years of this analysis. 2. The exception to the observation above is that period from 2003 to 2006, following the formation of the Department of Homeland Security. In that instance the federal government needed to acquire a lot of space quickly, an effort that generally favored existing buildings. 3. The volume of space occupied in the 1990s is probably a little understated in this graph as some GSA tenants that originally occupied buildings of that era may have since exited. However, the volume of new lease-construct projects increased after 1995 in reaction to security concerns in the wake of the Murrah Building bombing. Generally speaking, lease-construct projects are 15- to 20-year leased so the shape of this trend should be pretty accurate. 4. 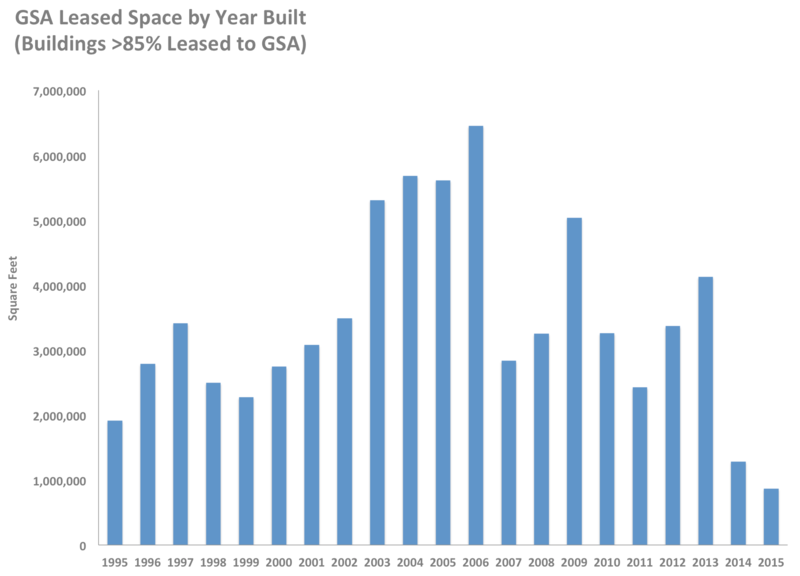 As measured by building age, occupancy of GSA-leased space has generally declined since 2007, and especially in buildings constructed in the past 2-3 years. This correlates with the surge in short-term leasing that began in the late 2000s and which has persisted to the present. The anomalous data in 2009 and 2013 are due to delivery of two of the largest leased projects in GSA’s inventory. In 2009, the 1.36 MSF Constitution Center project delivered in Washington, DC (it was originally leased by SEC but later backfilled by other agencies). In 2013, a new 1.5 MSF NNSA facility delivered in the suburbs of Kansas City. We do not anticipate any other projects of this scale in the near term. 5. This may be a statement of the obvious, but it must be noted that real estate leasing is a lagging indicator. In the era since the nadir of the Global Financial Crisis, budget constraints, rising debt and other factors have led GSA to substantially scale back construction of new leased facilities. Nonetheless, the volume of GSA-leased square footage in newer buildings is buoyed by deliveries of lease-construct projects that were initiated years ago. Looking forward, we do not see much construction underway, nor do we see many new lease-construct procurements. 6. Despite the grim observations before this, the GSA leasing market is structurally poised for a recovery. The reasons are two-fold: First, there is a huge pile-up of leases, such that one-fourth of the inventory expires in the next two years. This pile-up is due to a variety of factors but one of them is that the agencies have been challenged to initially freeze, and now reduce, their space inventories. Planning for this has caused agencies to engage in short-term extensions but it will eventually lead to long-term leases that should bolster occupancy in newer buildings. Second, mandates from both the President and Congress to improve sustainability will favor newer, energy efficient buildings. We can’t say that this will lead to more construction but it should ultimately increase occupancy in newer product.